To honor those who have served their country and defended our freedom, we are offering free admission to all veterans (with ID) on Veterans Day, November 11th. Thank you for your service! Dinosaur World offers free admission to active duty military (with ID) year round. Dependents receive $1 off. Special thanks to all who visited our parks in October and brought donations for the Barren River Animal Welfare Association (BRAWA) in Kentucky, the Humane Society of Tampa Bay in Florida and the Glen Rose Animal Control in Texas. 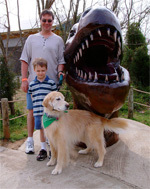 We hear the buzz at the dog park is that Dinosaur World is a great place to visit for dogs and dog owners. Need to keep the kids occupied while you prepare the big feast? Looking for a place to walk off some of those extra helpings of pumpkin pie? 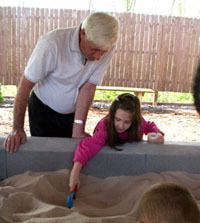 Dinosaur World in Florida is open on Thanksgiving Day from 9:00 am to 5:00 pm. 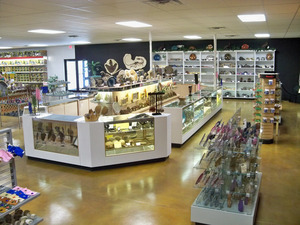 In fact, our Plant City, Florida location is open all year round! Dinosaur World in Cave City, Kentucky and Glen Rose, Texas are closed on Thanksgiving Day and Christmas Day. Grandparents visiting Dinosaur World on the first 3 Sunday's in November receive free admission with a fully paid child admission (one free grandparent per paid child admission). Visit us on November 4th, 11th or 18th and enjoy a dinoriffic day making memories with the grandkids. To create a lasting reminder of the fun, share your pictures with our Facebook fans! If you're looking for Christmas ideas, check out our giftshop (park admission not required). With over 5,000 square feet of everything dinosaur, you are guaranteed to find something for those dinosaur lovers and others on your gift list. For kids, you'll find stuffed animals, assorted dino related books, puzzles, dinosaur action figures, collectable dino trading cards, T-shirts, hats, trucks and lots more. Choose from a wide range of authentic fossils, jewelry, agates and polished stone, home decor items for the bigger kids on your list. Pick up a pterodactyl ornament for your Christmas tree and don't forget to look for a unique stocking stuffer! A Dinosaur World annual pass makes a great Christmas gift. If you come twice a year, it's worth the price, but we hope you'll visit more than twice! One day admission gift tickets are also available.